Catsparella: Shop Miss Ella Cat Heart Necklace and Percy Print Giveaway Winner! 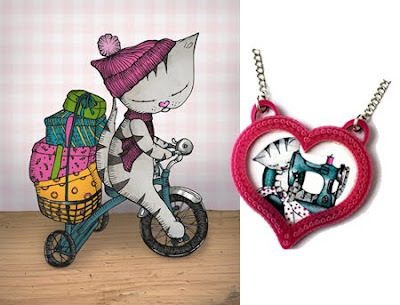 Shop Miss Ella Cat Heart Necklace and Percy Print Giveaway Winner! Thanks to everyone who entered the Shop Miss Ella Cat Heart Necklace and Percy Print Giveaway! I used Random.org to determine the winner, and it selected comment #62 belonging to Adele Bee Ann who wrote, "I have a Percy cat too! But mine is Perci, we call her Perci girl :)"
For information on how to purchase Ella's adorable cat prints and jewelry, including the items featured in this post, please visit her Shop Miss Ella store on Etsy! Ella's artwork is so sweet!! I did visit her Etsy...and bought the cat mermaid necklace! Cannot wait for it to come. I'm so excited to be the winner! As a fellow Etsy seller I'll be sure to spread the word about Ella's shop, her work is super cute! Love it! Thank you Ella! I got the picture and necklace, they are adorable! Thank you thank you thank you, they brighten my day. And, thank you too Catsparella! Aww, that's a lovely necklace. Did you use a silver necklace sterling for that? The cat pendant is just so adorably cute!